Mark O’Dowd, Glanmire Community College Co.Cork with Ian O’Sullivan and Eimear Murphy from Colaiste Treasa Kanturk Co.Cork. 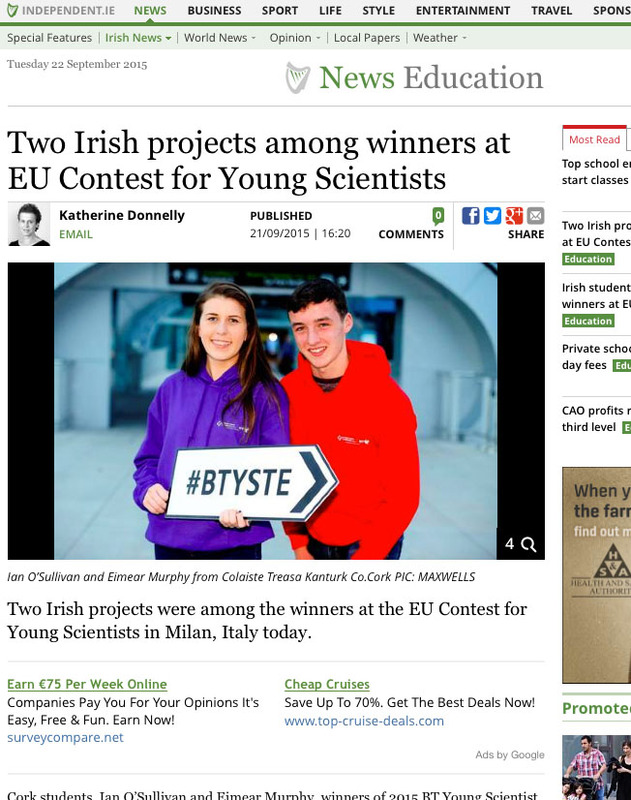 The 2015 winners of the BT Young Scientist & Technology Exhibition, Ian O’Sullivan and Eimear Murphy, have been awarded the international travel award Intel ISEF at the European Union Contest for Young Scientists (EUCYS) in Milan today. The winning duo represented Ireland at the international competition over the past four days and will now go on to compete at the Intel ISEF competition in Phoenix, Arizona in May 2016. Also on the winners’ podium in Milan today was Mark O’Dowd from Glanmire Community College, Co. Cork who won one of three first places at the Food Expo ‘Feeding the planet. Energy for life’ competition which runs alongside the European Union Contest to celebrate Expo 2015 taking place in Milan throughout this year. Mark wins a laptop and attendance at the closing ceremony for Expo 2015 taking place later this year. 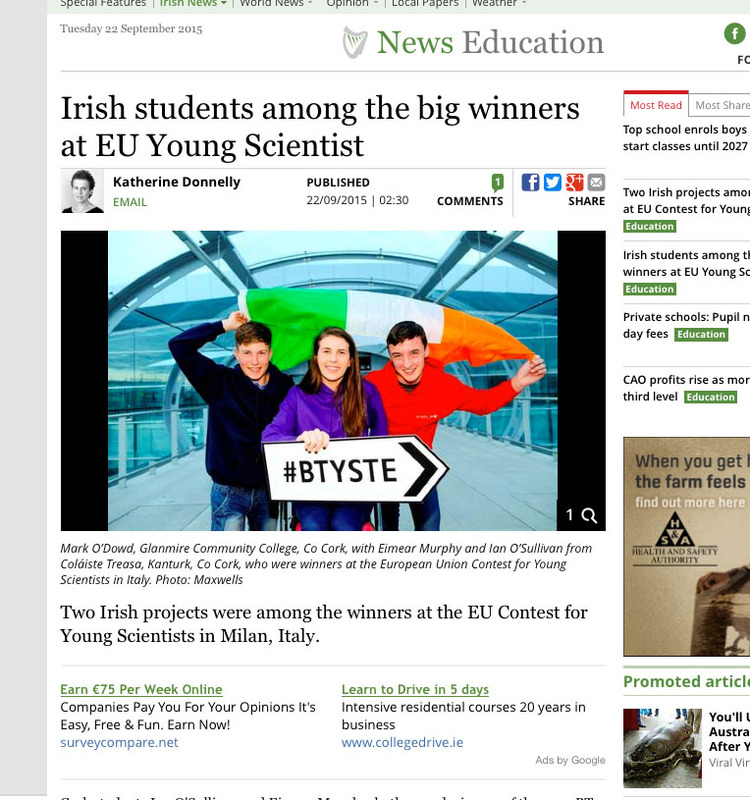 Ian and Eimear, who are both fifth year students at Colaiste Treasa, Kanturk, Co. Cork, won the chance to represent Ireland at the EUCYS in January when they were named winners at the BT Young Scientist & Technology Exhibition with their project ‘Alcohol consumption: does the apple fall far from the tree?’. Their award-winning project investigated the association between adolescent alcohol consumption and their parent’s consumption pattern and attitudes towards alcohol use. Mark picked up a special award at the exhibition in January to take part this week at EUCYS with his project ‘Injury increasing crop yields’. He was one of 18 projects taking part in the Food Expo ‘Feeding the planet. Energy for life’ competition over the past few days. The European Union Contest for Young Scientists is an initiative of the European Commission that was set up in 1989 with the goal of promoting cooperation and interchange between young scientists and guiding them towards a future career in science and technology. 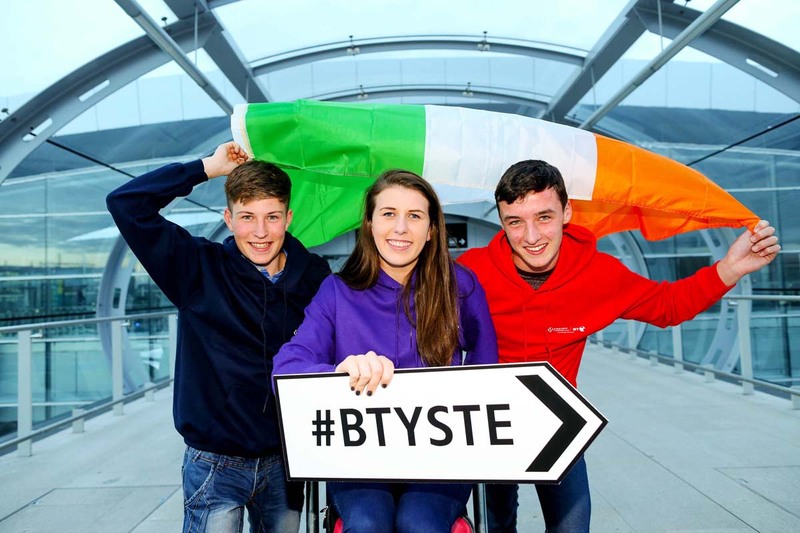 To date, Irish students have out-performed every other competing country in Europe at the EUCYS, with BT Young Scientist & Technology Exhibition winners taking first place 14 times. 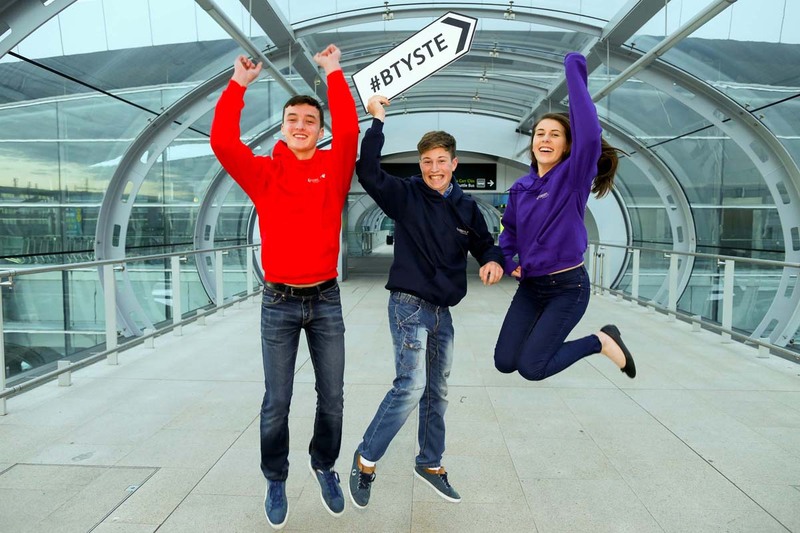 The BT Young Scientist & Technology Exhibition 2016 will take place in the RDS, Dublin from 6th – 9th January 2016 and the closing date for entries is fast approaching. Students have 8 days left to get their one-page submission in by Tuesday 29th September 2015. 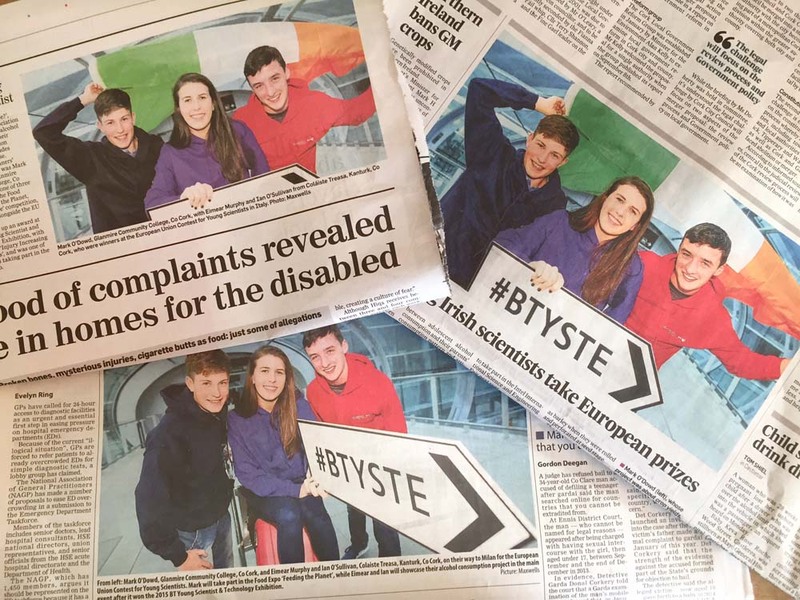 As well as the opportunity to have your project shortlisted and experiencing a week at the exhibition in Dublin, there are also over 120 student, teachers and school awards to be won, including cash prizes, international trips and the overall title of BT Young Scientist & Technologist(s) of the Year. For more information on the exhibition and for details on how to enter, log onto www.btyoungscientist.com or follow the exhibition on Twitter @BTYSTE.